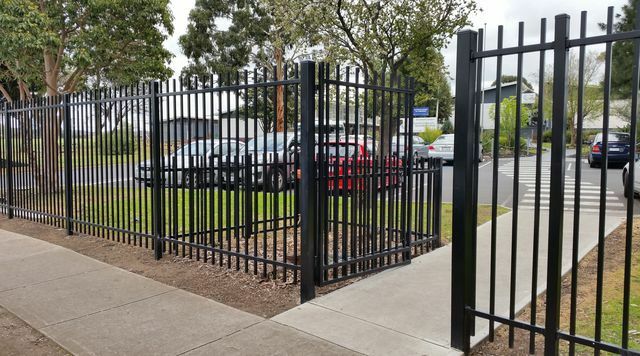 More and more businesses and schools are replacing existing chainmesh fencing with the stronger and more robust tubular steel fencing and gates, and if you are in Melbourne we can help you. Pre-fabricated steel panel with a series of uprights and two rails supported between posts in concrete footings or base flanged to existing concrete. Gates are manufactured to meet the requirements of the site and are designed to the same profile as the panels. SAS Fencing provide a number of tubular fencing and gate options for your business, school or council. be custom made to fit your existing keys or for child safety. SAS Fencing offer a wide range of tubular fencing services to the following suburbs: Airport West, Albert Park, Albion, Alphington, Altona, Altona Meadows, Altona North, Ascot Vale, Avondale Heights, Balaclava, Balwyn, Bayswater, Bentleigh, Blackburn, Box Hill, Braybrook, Brooklyn, Brunswick, Brunswick Nth, Brunswick West, Bulleen, Bundoora, Cairnlea, Camberwell, Camberwell East, Cambellfield, Carlton, Carnegie, Caroline Springs, Caulfield, Chadstone, Chirnside Park, Coburg, Coburg North, Clayton, Collingwood, Craigieburn, Dallas, Deerpark, Derrimut, Docklands, Doncaster, Donvale, East Melbourne, Elsternwick, Eltham, Elwood, Essendon, Fairfield, Fitzroy, Flemington, Footscray, Forest Hill, Glenroy, Greensborough, Hawthorn, Heidelburg, Hoppers Crossing, Jacana, Keilor, Keilor East, Keilor Downs, Kensington, Lalor, Laverton, Laverton North, Maidstone, Maribyrnong, Melbourne CBD, Melton, Mont Albert, Moonee Ponds, Newport, Northcote, Oak Park, Oakleigh, Parkville, Prahran, Preston, Preston West, Rockbank, Seddon, Somerton, South Yarra, Southbank, St Kilda, Sunbury, Sunshine, Sunshine North, Sydenham, Thornbury, Toorak, Tottenham, Werribee, Werribee South, West Footscray, Williamstown, Wynham Vale, Yarraville and more.